Several offices of Japan's biggest advertising agency have been raided over suspicions its employees are being made to work excessive hours. The raids come after the suicide of a 24-year-old Dentsu employee - the labour ministry ruled it to have been "karoshi", or death by overwork. Dozens of ministry officials entered Dentsu's Tokyo headquarters early on Monday morning, said broadcaster NHK. Raids were also carried out on offices in Osaka, Kyoto and Nagoya. The Tokyo offices have already been raided once, in October. The female employee who died last December had worked 105 hours of overtime in October 2015, and was suffering from severe depression. Long and often unpaid overtime is a persistent problem in Japan. It has been blamed for depressing the economy and even the birth rate, as well as the more immediate effects on the wellbeing of workers. 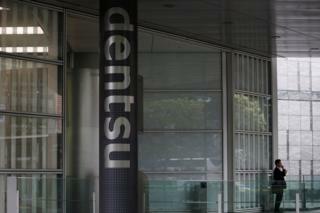 Dentsu - the world's fifth largest ad agency by revenue - has already begun internally investigating the issue. It has previously said it is co-operating with the investigation, which could lead to criminal charges if suspicions of widespread abuses are confirmed, NHK said. "We take labour standards extremely seriously and want to proactively try to remove karoshi from Dentsu's working culture," it said in a statement.